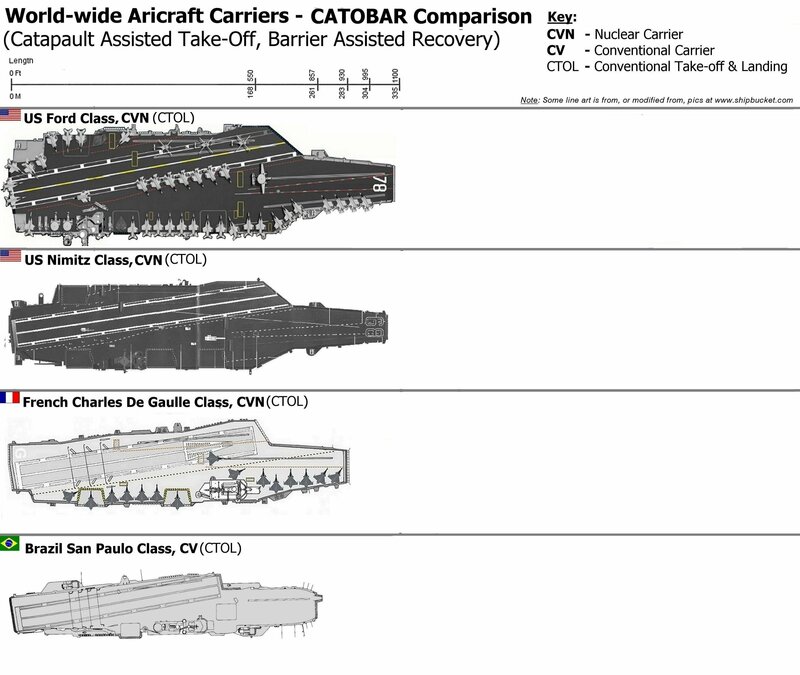 CATOBAR - This stands for Catapault Assisted Take-Off, Barrier Assisted Recovery. Using "trap lines" to stop an aircaft while landing, and a catapault to help it launch, means that much heavier, larger aircraft loaded with more weapons can operate off of the carrier. These are the iconic, most easily recognized and considered aircraft carriers, with the most flexability and capability. When one thinks of carriers they invision these types of vessels...and they generally envision the United States and their nuclear powered, super-carriers. These type of carrier are also the most expensive. In the US case, the new,Gerald Ford Class super carrier can costs 7 billion dollars or more to build, and hundreds of millions per year to operate. These types of carriers not only can carry aircraft with more fuel and weapons...they also can operate large AEW aircraft. All of these increase the capability of the carrier and its ability to project power and defend itself. 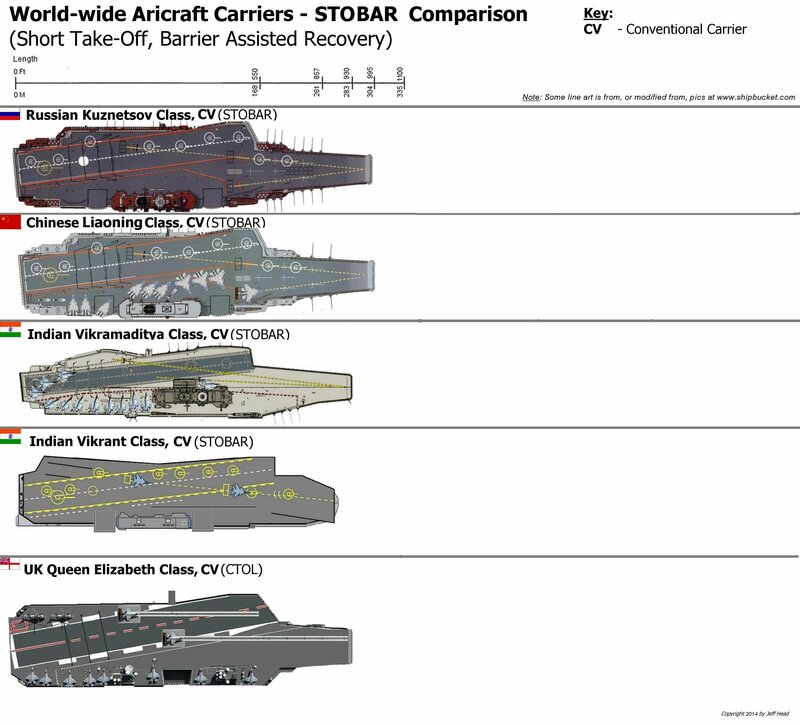 Within this type of aircraft carriercategory you also find both nuclear powered and convetnional powered carriers. There are only three nations who either have, or are currently building thirteen such aircraft carriers. The United States (11), France (1), and Brazil (1). 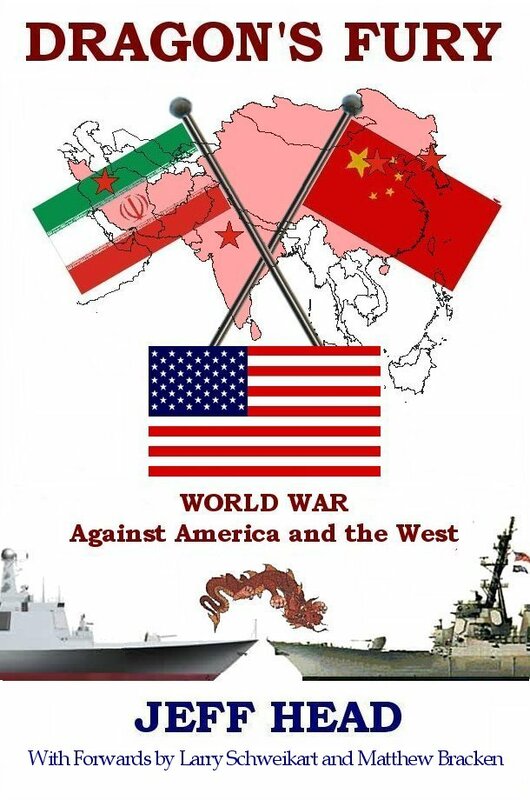 SUMMARY - Summing it up then, there are 13 different nations operating a total of 48 aircraft carriers in the world today. These carriers are divided into the three categories mentioned, but also represent 20 different classes of vessels from the various nations. The numbers are growing. Twenty years ago the number of countries who operated such vessels was 7 with 38 vessels. Ten years ago it was 9 countries with 42 vessels, as stated, today it is 13 countries with 48 vessels. The trend is for the numbers to continue to grow. This is because of the versatility and power projection capabilities these vessels provide a nation's leaders through its navy...the ability to protect its assests and interests far from home and without the need for an airfield from a friendly country, or one that is either captured or built being necessary to get that nation's aircraft to the area where they are needed. Note: Any donation helpful towards hosting/bandwidth/domain/maintenance costs...but the site remains free to use.